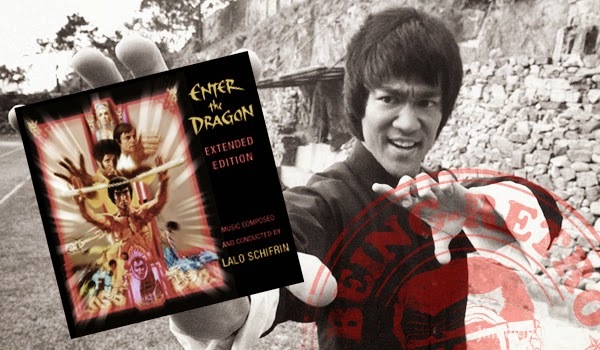 (October 7, 2014 – Los Angeles, CA) Aleph Records is proud to release the ENTER THE DRAGON: EXTENDED EDITION soundtrack on CD November 11, 2014. The album features 56 minutes of Lalo Schifrin’s original score, much of it previously unavailable in any format. "It was a challenge to take music from the Orient – not the stereotypical Fu Manchu ideas that Hollywood had about Chinese music, but something more authentic – and do it bigger than life, as Ennio Morricone had in the spaghetti westerns," said Schifrin. ENTER THE DRAGON was the first martial arts film produced by Americans and would be actor Bruce Lee’s final film. Both the film and Schifrin’s score have earned cult followings in the 40 years since the initial release. The film was added to the National Film Registry in 2004. But to a certain generation, it is Schifrin’s score for ENTER THE DRAGON that set the standard. Director Brett Ratner (who would go on to hire Schifrin to score his RUSH HOUR trilogy) said “ENTER THE DRAGON is one of my favorite movies, but its one of my favorite movies for one main reason: that it’s the best score I have ever heard in any movie,” (KCRW interview, October 26, 2011). Recruited by an intelligence agency, outstanding martial arts student Bruce Lee participates in a brutal karate tournament hosted by the evil Han (Kien Shih). Along with champions Roper (John Saxon) and Williams (Jim Kelly), he uncovers Han's white slavery and drug trafficking ring located on a secret island fortress. In the exciting climax, hundreds of freed prisoners fight in an epic battle with Lee and Han locked in a deadly duel. "Lee told me that there was a 2,000-year tradition in martial arts," Schifrin described his first meeting with the film’s star Bruce Lee. "He had to learn all of the rules in order to break them. Right away, I found we had that in common: I studied classical music, centuries of European classical tradition, rules and regulations, things that you can and cannot do. And then we break all the rules." Featuring 56 Minutes of Music, Much of It Previously Unavailable In Any Format, available on CD on November 11, 2014.